Grass in Your Flower Beds? Most homeowners crave a beautifully manicured, lush carpet of turfgrass. The sea of thick, green grass surrounding the Viette home is the envy of visitors who come to wander through the extensive gardens surrounding their home. Yes, grass is nice – when it is growing in your lawn. It’s not so nice when it invades your flower beds and mixes in with your perennials, shrubs, and trees. 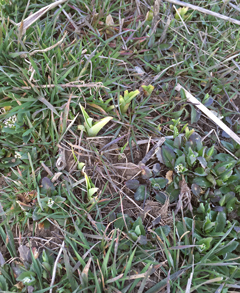 One of the worst of the grassy weeds is Bermudagrass; aka. wiregrass. This warm season, perennial grass is often used as a turfgrass in southern zones because it is tough and durable and quite drought and heat resistant. The problem is that it is a very aggressive grass and can quickly spread into flowerbeds if it is not kept under control. Even if you don’t have a Bermudagrass lawn, this invasive grass can take hold and overrun your gardens. 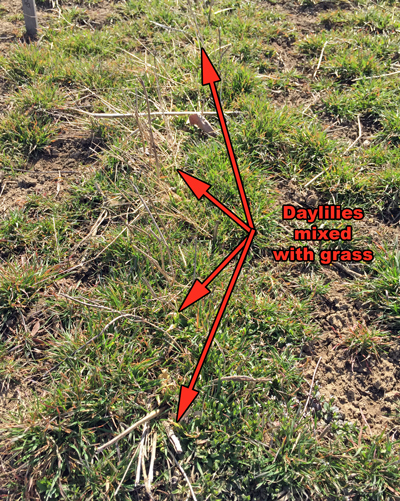 Other perennial grasses that can infiltrate cultivated areas are Johnsongrass, quackgrass, and perennial ryegrass. Annual grasses like crabgrass, barnyardgrass, and annual ryegrass can also be major headaches in flower gardens. The problem is killing the grass but not the desirable ornamentals. Glyphosate (Roundup) can be used but it is non-selective and you have to be exceedingly careful not to get any spray on your plants. This is difficult to say the least and impossible in cases where the perennials are growing (or trying to grow) through a sea of invading grass. 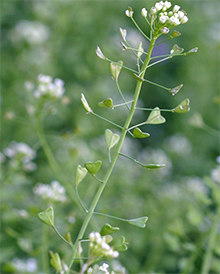 weeds like this field pennycress. Luckily, there is an answer – a selective herbicide containing the active ingredient sethoxydim. It can be found under the trade names Poast, Segment, and Vantage, among others. Bonide Grass Beater contains sethoxydim and can be found in most full service garden stores. When applied according to the label instructions, sethoxydim can be sprayed over the top of most non-grass perennials, shrubs, and trees without harming them. It does not kill broadleaf weeds or sedges (sedges are not grasses), but it is ideal for post-emergent control of both annual and perennial grass weeds in your flowerbeds. At Viette’s, we have had some serious problems with grass taking over a few large sections in several of our daylily fields. In the past, we have used glyphosate to spot treat between the rows but this year, grass came up right in the middle of the rows completely surrounding the clumps of daylilies. It was pretty bad! We had to do something or the grass would crowd out the plants. 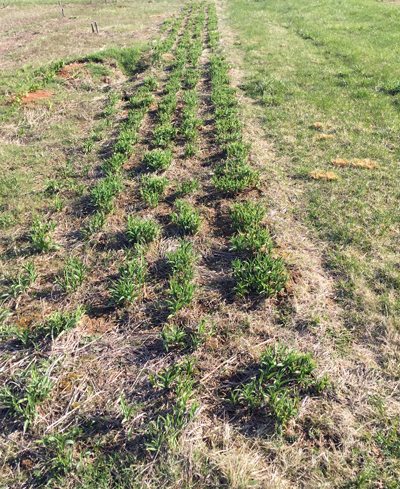 Our field manager and his helper used Segment (13% sethoxydim) to spray these patches of grass in the fields. Because daylilies are listed as tolerant to sethoxydim, they were able to spray right over the daylilies without harming them. 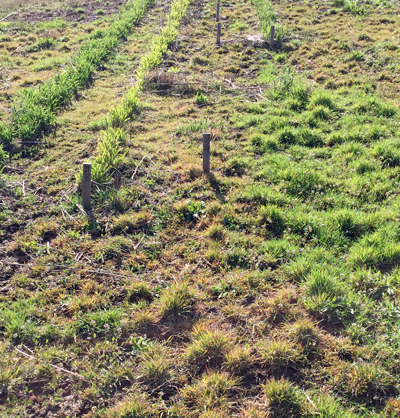 This is ideal for post-emergent grass control in our fields. the grass begins to burn back. The label on this herbicide is extensive and it is important to read and follow the instructions. The label includes a long list of tolerant species of perennials, shrubs, and trees. It can even be used in the vegetable garden when applied according to the label directions. Fourteen days later. The green patch on the right was skipped. to kill this grass. The daylilies have grown well – no ill effects! Bo edged this 5-row bed. The results are evident! It did a pretty good job eliminating the grass! The daylilies look healthy and are growing well. Luckily I can’t say as much for the grass! Now they can go back through all the fields and spot treat the broadleaf weeds with glyphosate. The fields should be in pretty good shape for the rest of the season! Good Uses for Old Stuff! Back when Eric and I were in graduate school at Penn State, the computer available to students was a giant mainframe that was housed in a computer center on campus. During the summer when we weren’t in the field collecting data, we basically lived in the computer center. This was kind of nice because in order to keep these giant computers from overheating, the whole building had to be air conditioned. 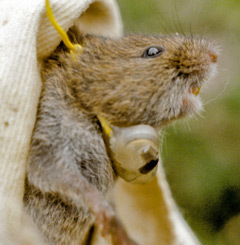 Being in the comp center offered a nice break from the hot crownvetch fields where we were using a combination of live trapping and radio telemetry to study the home range and movement patterns of meadow voles. We spent hours in the comp center entering data by punching cards (anyone remember that?) and later by typing our location data into a remote terminal. We would then plug the data into various programs to plot the locations and run statistical tests. The jobs were submitted to the big mainframe computer, and then we had to wait for them to run and eventually print out on the wide, continuous feed, green bar paper (or sometimes a heavier weight white paper). Depending on the job queue, it could take quite a while to get a printout. My how technology has changed since those days! Anyway, there IS a point to this story! Our years at Penn State left us with boxes and boxes of computer paper output which Eric has been storing in his office at the college. 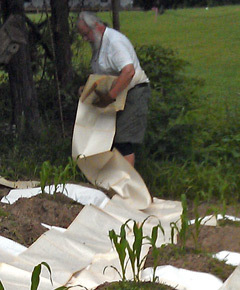 Last year, he decided that it would make the perfect mulch for our vegetable garden so he brought two boxes home for use in the Three Sisters Garden. 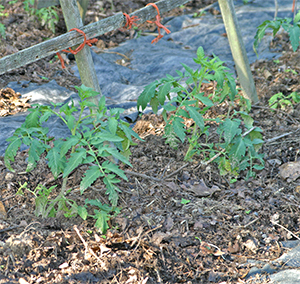 One year we mulched the tomatoes with composted leaves. We have discovered that for people with busy lives and big vegetable gardens, mulching is one of the keys to success. A cover of mulch around the plants and throughout the vegetable garden is wonderful way to reduce weeds and thus the time spent weeding. 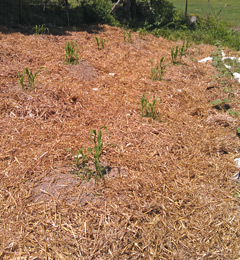 Mulch also helps maintain soil moisture and keeps the soil from drying out too quickly. This not only saves water because you don’t have to irrigate as often, but the more even soil moisture helps to prevent blossom end rot in tomatoes. In addition, mulching the vegetable garden helps to reduce disease problems so you spend less time (and money) spraying fungicides. Fungal diseases, such as early blight, late blight, and septoria leaf spot, are the main destroyer of tomato plants. 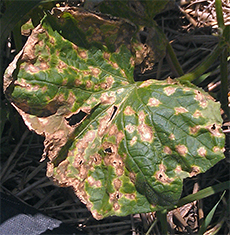 Downy mildew and anthracnose can wreak havoc on cucumbers, squash, and other cucurbits. The fungal spores that spread these diseases are lurking in the soil just waiting to jump onto your vegetable crops. A layer of mulch can prevent these spores from splashing up onto the leaves of your plants during a rainstorm or when the plants are watered. 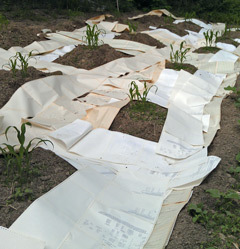 The mulch we usually use in our vegetable garden is a thick layer of newspaper covered with straw. This works really well and the newspaper prevents most of the straw seeds from germinating in the garden. Last year, we substituted the computer paper for the newspaper – it worked really well! Since each computer job generated pages and pages of continuous output, we could literally walk backwards through the garden unfolding the paper as we went. When you got to the end of a row, you could either tear the paper at a perforation or turn around and go back to lay down a second (or third) layer. It was easy as long as the wind wasn’t blowing but this is true with the newspaper as well. Usually one of us would spread the straw as soon as the paper was laid down thick enough. Straw completely covers the paper. Laying computer paper goes much faster than putting down sheets of newspaper and it’s a great way to recycle the boxes of computer output that have been cluttering Eric’s office for all these years! But … I suppose there aren’t too many people that have boxes of old computer paper lying around! Oh well, mulch that garden with something – you’ll be glad you did! 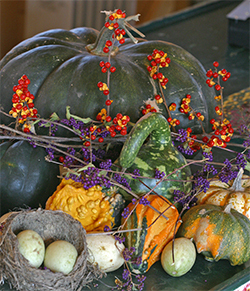 Here’s to a prosperous gardening season with loads of fruits, vegetables, and flowers! 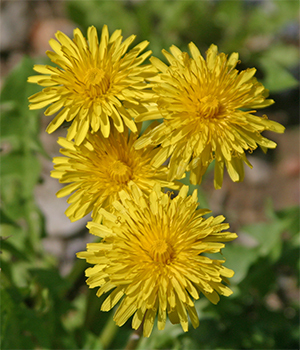 Dandelion flowers are bright and cheery even if they are a bothersome weed. Dandelions are popping up all over in the fields near Viette’s. I guess spring is really here! The sight of these cheery yellow “wildflowers” reminded me of one of my favorite posts on the Viette View’s blog. I am re-posting it today as a fun (and hopefully informative) spring read. I was thinking about dandelions the other day – actually I’ve been thinking about dandelions a lot lately. They seem to be everywhere; the ubiquitous lawn weeds! Actually, I think they’re rather pretty – so bright and colorful in the lawn, like an oasis in a giant sea of green! When we were kids, my sisters and I had to go out each spring and dig up all the dandelions we could find in the lawn. “Be sure to get the whole root or it will grow back,” my dad would say! If only they would just bloom and then go away, it would have saved us from a lot of work! But of course they don’t. Dandelion seed heads are filled with seeds ready to float away on a gentle breeze. They have the nasty habit of going to seed and then spreading all over the place. First you have a few in the lawn, and then you have an epidemic! And, what little kid can pass up the temptation of blowing on a dandelion seed head just to watch the little “parachutes” float away on the wind? I know I did it – but it sure annoyed the grownups when I was caught in the act! So … you have this great idea that you’ll chop the dandelions off with your mower before they go to seed. But, after you mow, they’re still there blooming away in all their golden glory. How very frustrating! Well, here’s an interesting characteristic of dandelions that I never really noticed before. Have you ever watched the progression of their flowering cycle? 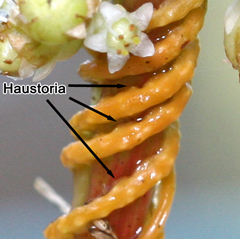 When they are blooming, the flower stems are relatively short which keeps the flowers close to the ground. This is especially evident when they are growing in your lawn. Dandelions have developed this clever little adaptation as a defense against herbivory – and what is your lawn mower but a giant mechanical herbivore (in a manner of speaking)! 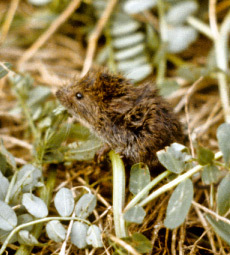 Flowers and foliage that grow close to the ground are less likely to be nibbled off by browsing herbivores/lawn mowers. In a spurt of growth, the stems carrying the dandelion seed heads shoot upward well above the original height of the flower. 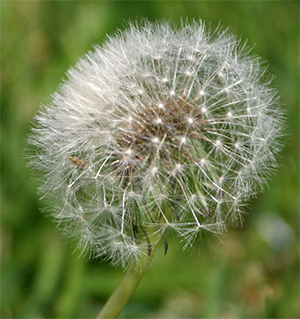 Once the flower closes and the seeds are formed, the dandelion stem undergoes a rapid growth spurt. Seemingly over night, the stems shoot up 2 or 3 times the height of the original flower stalk. Of course this occurs right after you’ve mowed the lawn and the tall, fluffy seed heads rise well above your neatly manicured lawn! That’s evolution for you! Survival of the quickest (grower that is)! And there they are, like a bunch of time bombs above your beautiful grass ready explode and spread their seeds with the next puff of wind! There are products you can use to eradicate these bothersome weeds from your lawn. 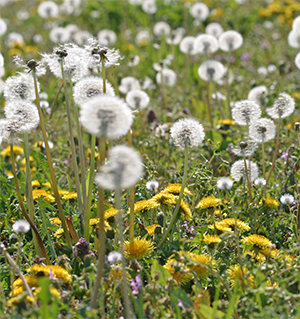 Pre-emergence weed killers can prevent dandelion seeds from germinating or post-emergence weed killers such as Bonide Weed Beater Ultra or Gordon’s Speed Zone can destroy the weed itself. Bonide Weed Beater Complete and Bayer Advanced Season Long Weed Control for Lawns contain both pre-emergence and post-emergence herbicides. Always read and follow the label directions whenever you use any pesticide! The other day as I drove down our road on my way to work, a bright patch of yellow and red caught my eye. 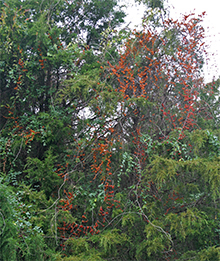 I looked over and saw a colorful bittersweet vine draped over a dead black locust tree at the edge of the road. Since I had my camera with me, I stopped to take some pictures. 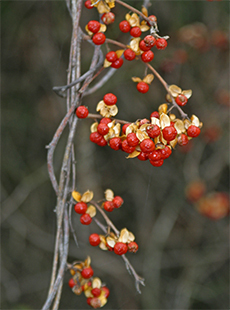 The berries of bittersweet are quite beautiful and sections of these berry laden vines are often used in natural fall arrangements. 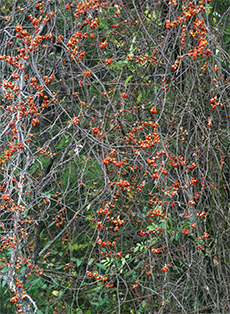 There are two types of bittersweet vines that can be found over much of the eastern half of the United States; the good guys, American Bittersweet (Celastrus scandens) and the alien invaders, Oriental Bittersweet (Celastrus orbiculatus). 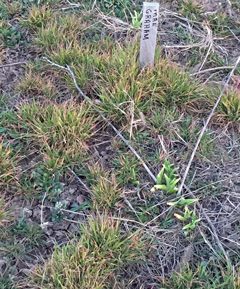 Unfortunately, the bittersweet that is growing on our property is oriental bittersweet and by all accounts, I should go out with Roundup and kill it off – the sooner the better. How sad because it is such a colorful vine and would be great for fall decorating. I guess I could still harvest some nice pieces of the vine before we annihilate it! Oriental bittersweet is a deciduous vine that is native to Asia. It was introduced to the United States in the 1860’s as an ornamental plant. I can understand why it was considered desirable because the fall berries are very colorful and extremely plentiful on the vine. and into the nearby cedars. 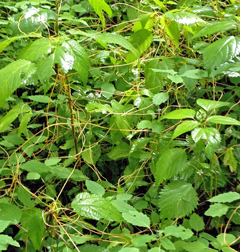 According to the Plant Conservation Alliance, though, oriental bittersweet has escaped from cultivation and become an “ecological threat” to our native plants because the vigorous vines quickly grow up and over trees and shrubs. Eventually they kill the trees by either girdling them with their thick constricting vines, shading them out with their dense foliage, or uprooting them with their excessive weight (especially after a heavy snow). In addition, oriental bittersweet is successfully outcompeting our native species, American bittersweet, and replacing it in the wild. 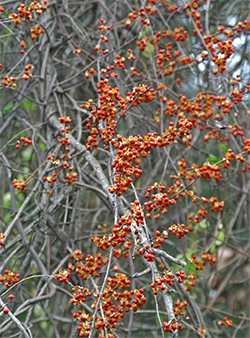 Oriental bittersweet has been listed as an invasive species in at least 21 states. One of the reasons that it spreads so easily is that it reproduces readily from seed – and it produces a lot of seed. In addition to germinating from fruit that drops to the ground, the seeds are also dispersed by birds that eagerly gobble up the berries and deposit the seed over a wide area. The plants are pretty adaptable to different growing conditions so these “deposited” seeds often germinate where they drop. 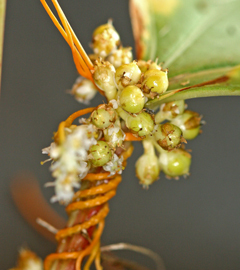 Both American bittersweet and oriental bittersweet are dioecious which means they have separate male and female plants, like hollies. Berries are only produced on the female plants and only if a male plant is in the area to pollinate the female flowers. A relatively new cultivar of American bittersweet, Celastrus scandens ‘Bailumn’ (Bittersweet Autumn Revolution), produces flowers with both male and female parts (perfect flowers) so only one plant is needed to have beautiful berries in the fall. This is a great variety to plant in the landscape – just don’t plant it where it can climb on your trees or shrubs because, like the oriental bittersweet, it can damage and even kill them if it grows over them. 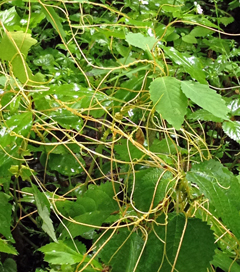 So how do you get rid of this extremely invasive alien plant? First make sure it is not an American bittersweet – these we want to save. If it is indeed oriental bittersweet, you can try digging it out but sometimes this is difficult. If it isn’t practical to remove them manually, you can control them by applying a product that contains glyphosate (such as Roundup) or a product that contains triclopyr (such as Bayer Advanced Brush Killer Plus). Be sure to read and follow the label directions when applying either of these chemicals. 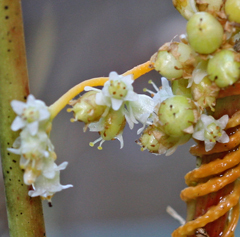 More information about identifying and controlling oriental bittersweet can be found on the Plant Conservation Alliance website. I suspect that the oriental bittersweet vine along our road had something to do with the demise of the black locust tree it was growing on but I’m not particularly sad because I’m not especially fond of black locust. However, I guess in the name of ecological preservation, we should go out this weekend and destroy this unwelcome alien. It’s very obvious that our spring has come early this year. The flowering trees at Viette’s are popping with amazing color and the spring bulbs are up and filling the gardens with more bright splashes of color. Shepherds Purse surrounded by a sea of chickweed. These common garden weeds came early as well and are up and blooming profusely in my gardens and even in some of Andre’s gardens. 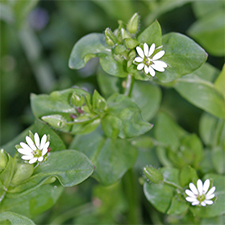 One of the earliest blooming spring garden weeds is chickweed (Stellaria). 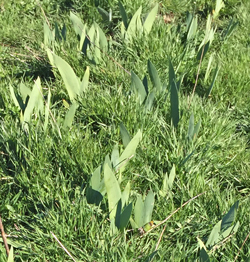 This annual weed is often categorized as a winter weed because it grows well in cooler conditions and it often forms bright green carpet of foliage as early as January or February – it even grows under the snow. One of the keys to its success as a garden weed is that it can go from a seed to producing its own seed in as little as 30 days. No wonder it’s so prolific! If you want to look on the positive side, chickweed does have some redeeming characteristics. The seed is a great source of food for the birds and the name “chickweed” comes from the fact that the seed and tender young foliage was at one time used to feed domestic chickens. The foliage is rich in vitamin C and the plant can be used as a source of wild greens. Hmmmm, I think I’ll stick with spinach! 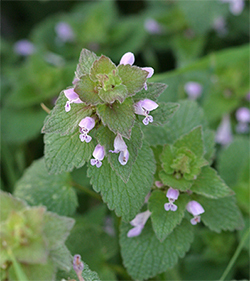 Two other widespread winter annuals that are blooming right now are Purple Dead Nettle (Lamium purpureum) and its closely related and equally invasive cousin Henbit (Lamium amplexicaule). They are members of the mint family and can be seen blooming profusely all around us, turning whole fields into a sea of pink and purple. In fact purple dead nettle is currently creating quite the ground cover in our blueberry patch. I definitely need to work on that. These annoying weeds often invade turfgrass and we get bombarded with questions in the spring about how to eradicate it. Of course, one of the best tips is to maintain a healthy, vigorous lawn through proper feeding, watering, and mowing. Mowing the grass high (no lower than 3″) will help to shade out most lawn weeds and a thick, well-fertilized lawn will usually outcompete the weeds. 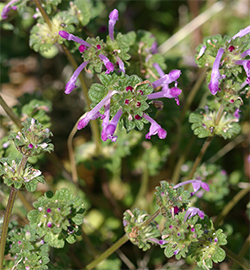 Henbit is often confused with purple dead nettle and vice versa. 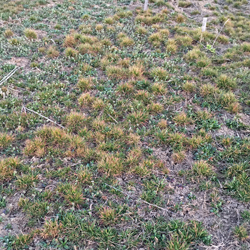 Pre-emergence herbicides to control winter annuals like chickweed, henbit, and the others I mention in this post must be put down in late summer or fall before the seed germinates. It’s much to late for that now. 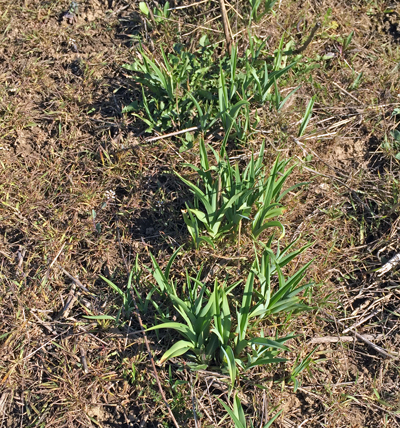 Once they are growing, hand weeding or the use of post-emergence herbicides are the best way to control them, especially if you catch them before they get a chance to set seed. Interestingly, henbit and purple dead nettle are kin to the beautiful (and better behaved) cultivated form of Lamium that many of us plant in our gardens; Lamium maculatum. The variegated cultivars, ‘Beacon Silver’, ‘Purple Dragon’, ‘Shell Pink’, and others are often used as attractive ground covers for the sun and shade. 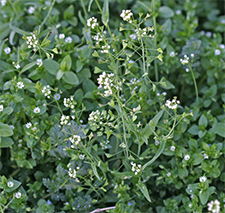 Shepherds Purse (Capsella bursa-pastoris) is a very common winter annual that produces copious amounts of seed in their little seed pods that resemble the purses once carried by shepherds, hence the name. Each plant is capable of producing 40,000 seeds which can remain viable for up to 30 years – yikes! But – the seed is peppery and can be ground into a mustard-like seasoning. Got hotdogs? Two delightfully cute little wildflowers I came across in the grass at the nursery are Persian Speedwell (Veronica persica; seen in the banner above) and Field Pansy (Viola kitaibeliana). 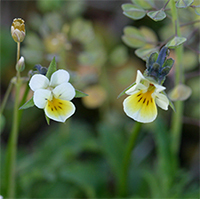 These tiny field pansy flowers are so cute! I know these weeds can be annoying to have in your lawn and many people strive to eradicate them but their little flowers are just so adorable – how could you?